Plumbers of Hollywood are men and women of many skills. 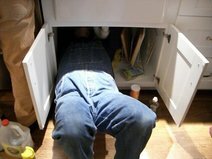 Introducing: Appliance installation services. Some of us don’t have time to install themselves their appliances, some others are not good with their hands. And finally, some others just love to get some help from our friendly team of appliance installers based locally in Hollywood Florida. Desperate housewives like to call us also, but for different reasons. Appliances installation started out as a hobby for us, helping neighbors, friends and family at first. After some time, we realized that we were actually quite good at this and decided that we should offer this service in our plumber company’s “menu” list. For a small fee, you can get some personalised help to install or repair any electric appliance at your place. In particular, we do dishwasher installation, dishwasher repair and replacement. We have found that this is one of the most commonly needed service for most people. We also service washer dryers, from installation to repair. We are actually great at fixing appliances, big or small. Appliance repair is a need for the community and we are offering this service mainly to provide value and those who are not comfortable dealing themselves with small appliances or even bigger appliances. Don’t be shy and give us a call today to see what we can do for you, it’s all about you, providing great value and service throughout the year at reasonable rates. Small appliance repair, appliances installation, call us overtime you order something from Lowes and we will be there to install tour Lowes appliances! Gas appliance, kitchen appliance, dishwasher hookup…our plumbing team can do it all and they will do it with style! They also deal with built in appliances and can fix them. Our appliance installation service is one of the best and we will answer all your most pressing questions if you give us a call or send us a quick email: what is the cost of dishwasher installation? Can you do cooktop installation? What about gas dryer installation? The answer to all these questions is yes obviously, the real billion dollar question is more “what is the plumbing service we cannot offer?”. Let us of the hard and tedious work while you’re doing something more interesting and come back only to enjoy the final result, press the button, your appliance is all set up! Ask us about our freezers/fridges service, our TV set up service. Appliance disposal is also possible in some cases, please contact us before in order to enquire about your specific case and the type of appliance you want to get rid of. Our installation service is second to none in the Hollwoody area and we’d love to hear from you. The wealth of knowledge and experience we have accumulated over the years is fabulous and we will share it with you, providing you with great installation and repair service. “If it’s broken, we can fix it” is our mantra. Crazy installation-repair team I know. But we still love them.